Barbecues and outdoor activities are the best parts of summer that the whole family can enjoy! Coming together with family and friends to share a meal is a great way to enjoy the outdoors and to connect with your community. BBQs can still be a great opportunity to make Health Happy choices that everyone will love. Try these tips and swaps at your next cookout to have the healthiest and tastiest BBQ. 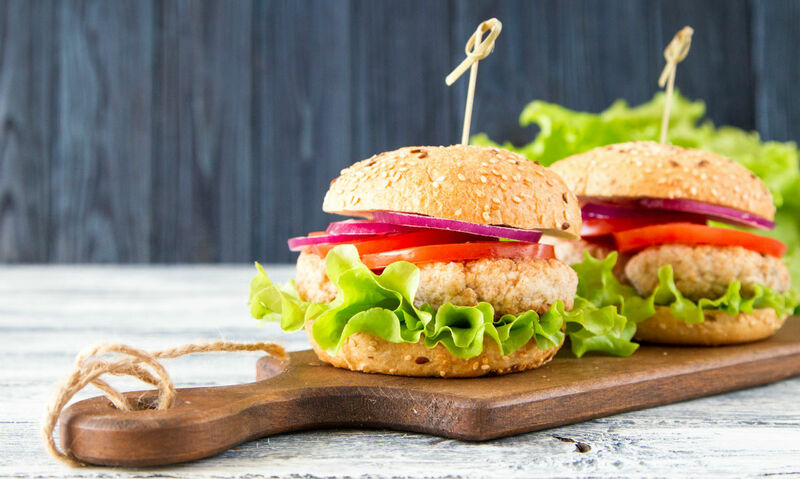 When we think BBQ, we usually think of hot dogs and beef hamburgers but there are many other flavorful options like turkey burgers, chicken burgers and veggie dogs. Try swapping out your regular burgers and hots dogs for different types of meat as red meat is higher in saturated fat then poultry. It’s not a BBQ without colorful vegetables and fruit! Vegetables and fruit are high in vitamins and fibre. Fruit can be a sweet option that’s always a crowd favorite. Tip: cut all the fruit up into bite size pieces and mix it together to make fruit salad which is easy to portion out. Choose a bun that says “Whole Wheat” on the label as it contains more fibre than white buns. Fibre helps us stay fuller longer. You can also try making an open faced hamburger or hot dog and share the bun with your neighbor or kids to decrease your carbohydrate intake. Great snack options are essential at a gathering with the family. Instead of chips try serving popcorn or lightly salted pretzels; these crunchy snacks are sure to satisfy and they have less fat and more fibre than chips. As the weather gets warmer it’s very important to stay hydrated, especially with active, playing children. Choose water and add some flavor by mixing in cut up fruit. Try freezing the cut up fruit to keep the water cold! Skip the pop and juice as it contains high amounts of sugar. Health Happy Tip: Don’t want to get rid of the pop? Diet pop is a better choice as it contains 0g of sugar. Need a frozen treat? Freeze yogurt and berries in popsicle molds and enjoy! These treats are just as tasty but have less sugar and more protein then a regular popsicle or ice cream. Make sure to store your meal items and ingredients in a large cooler or cooler bag. You can use ice cubes in the cooler or freeze a 2L bottle or jug of water and when it’s solid place in the cooler as an ice pack. If all the ice has melted and the food has been sitting in water for more than 2 hours, it is not safe to eat. Keep the cooler in a shaded area. The weather is nice so it’s time go outside! Physical activity is very important for heart health and keeping a healthy body weight. It’s important for kids to play and even more important for parents to encourage kids to get outside and join them! Here are some fun activities you and your children can do during a family or neighborhood BBQ with very little equipment needed! Tag: tag you’re it! A simple game of tag is a great activity for kids to run around with no equipment needed. Scavenger hunt: Make a list of items found in nature such as berries, feathers or small items found at your BBQ. Give the lists to the kids and see who can find the items the fastest! Limbo: All you need is some music and a stick or broom as a bar. Lower the bar each round and see who wins! Catch the tail on the dragon: To play, arrange kids in a single-file line and instruct everyone to hold onto the waist of the person in front of them. Tuck a bandana or piece of fabric into the pocket of the last one in the line. The front of the line tries to catch the “tail” or fabric. Once the bandana is captured from the tail, the tail becomes the head and they play again. Michelle Stevens is a Registered Dietitian with a Bachelor of Science in Human Nutrition from University of Manitoba. Michelle has been providing nutrition counselling for 2 years. She has experience working with clients for diabetes management, kidney disease management, weight loss and has inpatient and outpatient experience. She is excited to bring her knowledge to northern communities to help provide healthy options and nutrition education to families.